Promoting Positive Pathways to Adulthood (PPPA) is an online knowledge translation initiative consisting of ten hour-long training modules, and is available to service providers without charge. The modules are designed to build the capacity of direct service providers who are working with youth and young adults aged 14-29 who have mental health difficulties, and their families. Each module includes information on key topics, video clips of young adults and service providers, interactive questions throughout, and a quiz leading to a certificate of completion or continuing education credits at the end. Each module is accompanied by a reference and resource list, a glossary, and a set of practice exercises from the Pathways Transition Training Toolkit. The exercises are designed to assist participants to apply skills in situations similar to those they encounter in their work with youth, young adults, and families. Participants who complete modules successfully will be able to download a certificate for one hour of continuing education credit (CEU) or a certificate of completion. Please read our FAQ or contact Pauline Jivanjee at jivanjee@pdx.edu, Eileen Brennan at brennane@pdx.edu, or call 503-725-5015 for more information. The Pathways Transition Training Partnership has developed this series of short video trainings to provide brief overviews of key concepts and skills for working with youth and young adults with mental health needs. The 5-6 minute video briefs feature presentations by service providers and youth advocates and are accompanied by practice-oriented discussion questions and links to relevant resources for further learning. The first five video briefs focus on trauma-informed care, youth cultures, engaging youth in treatment, promoting family support, and shared decision making. Five additional video briefs will cover working with Native American youth, supporting young people as they form adult relationships, working with LGBTQ youth, collaborating with peer support providers, and supporting youth advocacy. The Pathways Transition Training Partnership has developed a set of practice competencies and Promoting Positive Pathways to Adulthood, a series of 10 free online training modules for service providers.These modules are designed to increase skills in engaging and supporting youth and young adults in the transition years who have mental health challenges. A brief description of the content of each module is available in our informational brochure. Each module is approximately one hour in length, and includes information on key topics, video clips of young adults and service providers, interactive questions throughout, and a quiz leading to a certificate of completion or continuing education credits at the end. Every module is accompanied by a reference and resource list, a glossary, a transcript, and a set of practice exercises from the Pathways Transition Training Toolkit. The exercises are designed to assist participants to apply skills in situations similar to those they encounter in their work with youth, young adults, and families. 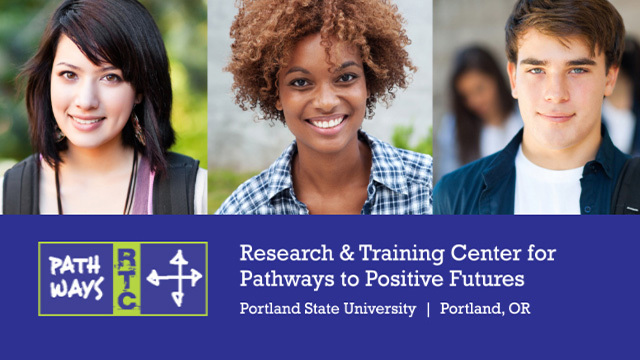 PTTP staff members recently conducted a study of outcomes of the Pathways transition training modules in collaboration with 20 PTTP Partner Organizations providing services to young people with mental health difficulties and their families. In collaboration with Youth MOVE National, the PTTP team conducted a national survey of transition service providers' training needs and preferences. A total of 254 service providers participated in the survey and a preliminary report of training needs and preferences is available. Training needs survey findings were used to guide the development and testing of Pathways Transition Training Video Briefs, a set of brief online topical trainings for service providers, featuring young adult advocates, mental health service providers, and cultural experts. Each video brief is accompanied by a list of relevant resources and discussion questions for applications in practice. For more information, please read our FAQ or contact Pauline Jivanjee at jivanjee@pdx.edu, Eileen Brennan at brennane@pdx.edu, or call 503-725-5015. This trailer previews ten 5-7 minute video briefs that provide overviews of key concepts and skills for service providers working with youth and young adults with mental health needs. Each video brief is accompanied by discussion questions and resources for further learning. This trailer gives an introduction to the Promoting Positive Pathways to Adulthood training series. Published online first in Journal of Emotional and Behavioral Disorders, this article describes outcomes of a longitudinal quasi-experimental study comparing cohorts of service providers receiving either online training only, or online training in conjunction with team-based practice activities. This article examined employment engagement (i.e., months of employment, hours worked per week, days of work missed due to the child's challenges) among caregivers of children and youth entering community-based mental health service systems. This paper reports on the identiﬁcation of a set of core competencies for service providers working with youth with mental health needs in the transition years and the development and psychometric testing of the Transition Service Provider Competency Scale (TSPCS), a 15-item self-report instrument. This new resource builds on work first published in 2010 to define each of the 15 core competencies needed by service providers working in mental health services with young adults of transition age, along with the attitudes, knowledge and skills needed to demonstrate it, and an example of the competency in practice. This tip sheet introduces service providers to scientifically-informed findings about brain development and trauma specific to young adults and the implications for trauma-informed interventions and trauma-informed engagement of young people in services. This tip sheet advises service providers on how to reach across fragmented services and systems to assist young people to achieve their goals. This congressional briefing sheet discusses the work-life challenges specific to families having children with mental health and other disabilities. It also describes the need for governmental policy supports for families raising children with disabilities. This tip sheet suggests ways providers can assist young people to strengthen their existing supports and/or to connect them with other supports, including emotional support, material assistance, and help with problem solving. The TSPCS is a self-assessment scale for service providers to assess their own level of confidence in a range of competencies for providing effective supports to youth and young adults in the transition years. This document instructs service providers in strategies for engaging families in supporting young people with the transition to adulthood. This document is the Spanish translation of Strengthening Family Support for Young People with Mental Health Needs in the Transition to Adulthood: A Tip Sheet for Service Providers, orginally produced in English. This document describes ten competencies that transition service providers working with young people with mental health difficulties should develop in order to be effective. This document is the Spanish translation of Tips on Core Competencies for Transition Service Providers, orginally produced in English. Presented at the Children's Mental Health Research and Policy Conference on Child, Adolescent, and Young Adult Behavioral Health, Tampa, FL, March, 2019. Presented at the Children's Mental Health Research and Policy Conference on Child, Adolescent, and Young Adult Behavioral Health, Tampa, FL, March, 2018. Presented at the Research and Policy Conference on Child, Adolescent, and Young Adult Behavioral Health, Tampa, FL, March 6, 2018. Presented at the Research and Policy Conference on Child, Adolescent, and Young Adult Behavioral Health, Tampa, FL, March 7, 2017. Presented at the Research and Policy Conference on Child, Adolescent, and Young Adult Behavioral Health, Tampa, FL, March 6, 2017. Presented at the Oregon Association of Vocational Special Needs Personnel 2017 Conference, Portland, OR, February, 2017. Presented at the Work and Family Conference, Washington, DC, June, 2016. Presented at the 29th Annual Research & Policy Conference on Child, Adolescent, and Young Adult Behavioral Health, Tampa, FL, March, 2016. Presented at the Western Social Science Association Conference, Portland, OR, April, 2015. Presented at the Oregon Association of Vocational Special Needs Personnel, Hood River, OR, February 21, 2015.